Who wouldn't love a lesson in cheese? With this clever cheese board made of reclaimed chalkboards from Franklin Elementary School in Quincy, Illinois, you'll never mix up the Jarlsberg and Swiss again. Features reclaimed wine cork feet to keep them from slipping and scratching the table. Divided into four sections. Includes a piece of chalk. Handmade in Wisconsin. Hand wash with soap and water. Small scratches can be buffed out with steel wool but these small scratches will, over time, add to the character and enhance the reclaimed nature of this product. I ordered two ... one was fine, the other wasn't level. Received a replacement, which was missing one of its "feet." On the other hand, service with Uncommon Goods was great and more than satisfactory, and I will continue to do business with the company. I love that it is so eclectic...smaller than I was expecting, even though the dimensions are listed. Poor packaging-foot was broken off and chalk was shattered. Overall happy, just wish I didn't have to fix & replace parts before giving it as a gift. Love the whole idea of recycling! I am giving this to my daughter who loves to entertain and she is very "green" conscious and so are her friends, I am sure they will love it!! This is adorable. I bought it for a foodie friend of mine and cannot wait to give it to her as a birthday gift. I've no doubt it will get many uses at her dinner parties. This board looks awesome - cute and different. I wish I were keeping it for myself instead of giving it away as a gift! I gave it to my son-in-law who loved it! I ordered this as a gift for an employee, and was so thrilled at the quality when it arrived, I ended up ordering one for myself! Combined with a nice bottle of wine and some local cheeses, it was a perfect gift this year! Perfect Gift...just check the measurements. Smaller than I thought. CHEESY - but in a good way! Fun gift for my wife - a real cheese expert! This unique cheese board is made of reclaimed school chalkboards. 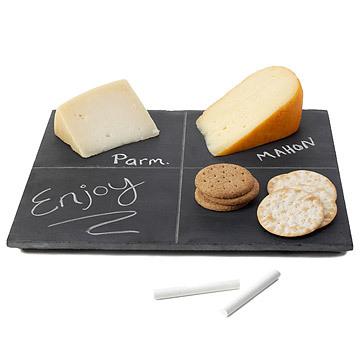 Easily label your favorite cheeses with chalk so you don't mix up Jarlsberg with Swiss.